Four Cotton Canvas 15" x 15" Place Mats. Gorgeous Teal, Blue and White Scroll Design on a Light Gray Background. Hand Wash, Line Dry. 80% Cotton, 20% Polyester. Decorative Square Placemat Set. This is a lovely set of four Vera royal blue butterfly cloth placemats. 15" square. Lot - Set of Six (6) red & ivory reversible placemats 17" x 17"
Lot - Set of Six (6) red & ivory reversible placemats 17" x 17". Freshly laundered, but need ironing. These are reversible, but the opposite side isn't really stitched as 'straight' as it should be, so I personally only used the 'flowery' designed side. These are either 100% cotton or a cotton/poly blend, I think. EUC - no stains, tears, etc. Shipped with USPS First Class Mail. Ecru Batten Lace Border/Edge. Sale is for 12 (1 Dozen) 'SQUARE' 100% Cotton Handmade Batten Lace Border Coasters or cupmat. Color-ECRU batten lace border. Fabric Middle. Handmade Batten Lace. Due to this being a handmade product, each individual piece vary in size and shape which range between 4 1/4 and 5". Cotton burlap mat has a natural burlap color with a 2" heavy lace border on all 4 sides. Machine wash cool, lay flat to dry. 100% Cotton. 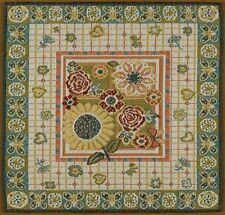 DRANSFIELD & ROSS Placemats Natural Square 15 x 15 in. Park Designs Wildflower Dinner Napkins could help usher in the warm weather! Our napkins are. made of 100% Cotton , designed with a pretty wildflower, bee, ladybug & butterfly print and the edge is finished off with a hem stitch. Beaded Placemat 15" square Flag inspired placemat 100% polyester. 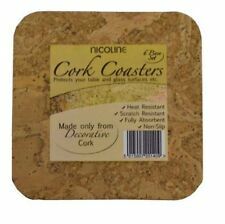 These tastefully designed placemats are elegant, but practical in beige and red. 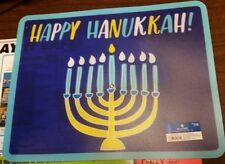 Perfect for year-round use. Revised 3/7/18--Since they are washed at different intervals, the intensity of whiteness may vary slightly. Sale is for 12 (1 Dozen) 'SQUARE' 100% Cotton Handmade Batten Lace Coasters or cupmat. Due to this being a handmade product, each individual piece vary in size and shape which range between 4 1/4 and 5". 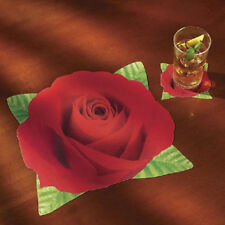 Placemats set of 4. Made from: %100 high quality polyester canvas duck fabric with hand-sewn finished edges. Great for any occasion and daily use. Machine washable. Wrinkle Resistant. No ironing needed. Hydrangea Cork Back Placemats - Periwinkle Blue Quantity - 4 Material - Cork Back Size - 14.5" x 14.25" Wipe clean with a dry cloth, do not submerge in water. New with the original packaging Made by Benson Mills All items come from a smoke free environment. RIVOLTA CARMIGNANI LUXURY TABLE LINEN NAPKINS TOVAGLIOLI BRAND NEW 13 1/2" X 15"
RIVOLTA CARMIGNANI LUXURY TABLE LINENS - TABLE NAPKINS. 10 RIVOLTA CARMIGNANI NAPKINS. 100 PERCENT COTTON, MADE IN ITALY. MADE IN ITALY OF THE BEST HIGH QUALITY 100% COTTON. THE BEST PICTURE OF THE COLOR IS #1. Safe Material: 100% food grade silicone material, non-toxic and odorless, BPA Free;. Lightweight and soft design allows you to roll it up and put it in diaper bag easily to take it wherever you go. The silicone placemat with waterproof and grease proof makes cleaning easily;. Pier 1 - 100% Palm Leaf Square Placemats - Set of 4 - Size 16" x16"
Made of palm leaf. See through with a flexible texture. These are cream and red checked placemats. They are 16“ x 16“ square. One of them does have a spot on the corner and the fabric is kind of hard and stiff there so I don’t know if that can be washed out or not. Sale is for 12 (1 Dozen) 'SQUARE' 100% Cotton Cloth/Fabric Embroidered Edge Coasters. Embroidered Edge. 100 % Cotton. Around 5.25--5.50 in (5 1/4-- 5 1/2). Item/Product must be in condition sent. Cynthia Rowley Spring Floral Paisley Placemat. I take pride in all of my products and would love to keep them all! If Needed I like to wash my linens in Dreft Baby Laundry Soap. A Variety of pictures will be provided so you may examine the product. Each coaster is made from quality cotton fabric with a layer of warm and white cotton batting for absorbency to protect your furniture. - Machine pieced and quilted. - Machine or Hand Wash in Cold Water. Safe Material: 100% food grade silicone material, non-toxic and odorless, BPA Free;. Lightweight and soft design allows you to roll it up and put it in diaper bag easily to take it wherever you go. Weight：7.05 ounce. Set of 4 Bamboo Place-mats. Sold individually so you can buy 1 or as many as you want. Machine washable - tumble dry on low heat. Background of napkin is white with butterflies and florals in all their many colors. Made of 100% Cotton. Bamboo Runners and mats are also available to match with, and you could have the perfect table setting. Easy to wipe, clean and easy to roll away after use. We will try our best to solve any dispute and try our best to satisfy you. Up for sale are these adorable placemats for your kitchen decor. Machine Washable. Pioneer Woman "Bandana" Placemats 15"x15" Set of 5 Green Yellow Reversible New! 15" x 15"Putting a fun twist on the classic icon, the Pioneer Woman bandana reversible placemat adds a fun touch to your frontier table. For an instant update to your dining room, the vibrant green colorway can be reversed to yellow and vice versa. 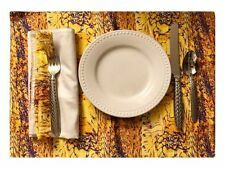 Component:Set of 4 placemats. The placemats for kitchen table is washable,easy care and clean,non-fading,non-stain,Not mildew,Wipe Clean,wearproof,dries very quickly. 4 x PVC Placemats. HIGH QUALITY PVC MATERIAL,DURABLE AND HEAT INSULATION. Set of 6 Coral orange cotton napkins 18"